Dissecting the Alt Right Online: is the ‘Alt Left’ an Invention? The ‘Alt Left’ is a term that could be thought to describe the loose movement of anti-fascists (Antifa) and others opposed to the rising ‘Alt Right’, especially in the US but also in Europe. Or does it? My team of researchers and I studied the hashtag space in Twitter in order to determine the substance and the publics behind the Alt Left; is it related to Antifa? Or is it an Alt Right construct? We also studied its resonance in the news to establish whether the term has mainstreamed, and the identity of its carriers. 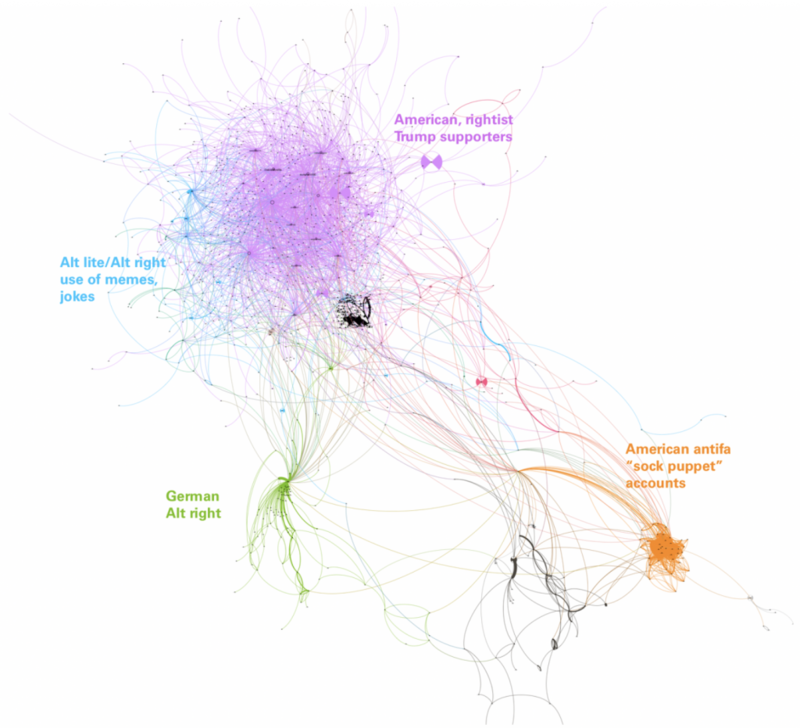 Finally, we studied the Alt Left’s usage in Reddit, the website that pools together over a million online forums, adding the subreddits (the different communities) in which it predominantly appears, and the imagery associated with the term. What are the Alt Left’s most significant substantive and visual associations? Has it been associated with violence, too, thereby creating an equivalence with the Alt Right, and the violent Unite the Right ‘free speech’ rally it held in Charlottesville, Virginia, U.S., in August 2017? The techniques employed by the team are forms of keyword, image, news, hashtag, and user analysis. Using Google’s BigQuery (for Reddit analysis), Lexis-Nexis Newsdesk (for news) as well as DMI-TCAT (for Twitter), we determined that the Alt Left is an artificial construct, a faux public, brought into being by Trump supporters as a kind of equal counterpart, in social media and the news, to the Alt Right. In the mainstream news analysis, we found that the notion of Alt Left resonates significantly on Fox News. Although it has been in relative decline since Charlottesville, the notion retains strength in the alternative right news space. With respect to its most significant semantic and visual associations, we found (in Reddit) that the Alt Left is mostly associated with violence. As for its publics or users, on Twitter and Reddit, the term is mainly employed by pro-Trump supporters. The findings provide strong indications that the Alt Left as such is an invention, employed predominantly in Alt Right spaces and right-of-center news. In short, pro-Trump supporters appear to have succeeded in creating a fictional anti-public, the Alt Left, associating it with violence, and mainstreaming it in the news. Does the Alt Left exist? Here the question concerns the relationship between the Alt Left and the Antifa, and the extent to which they could be considered the same or similar. On Twitter there is little to no overlap between Alt Left and Antifa (in the top 20 hashtags referenced in the two spaces) (see figure 1). From studying the hashtags, we can conclude that the discourse of the Alt Left on Twitter is situated in more mainstream political dialogues (GOP, Trump, etc). By contrast, the discursive environment of Antifa is much more complex. 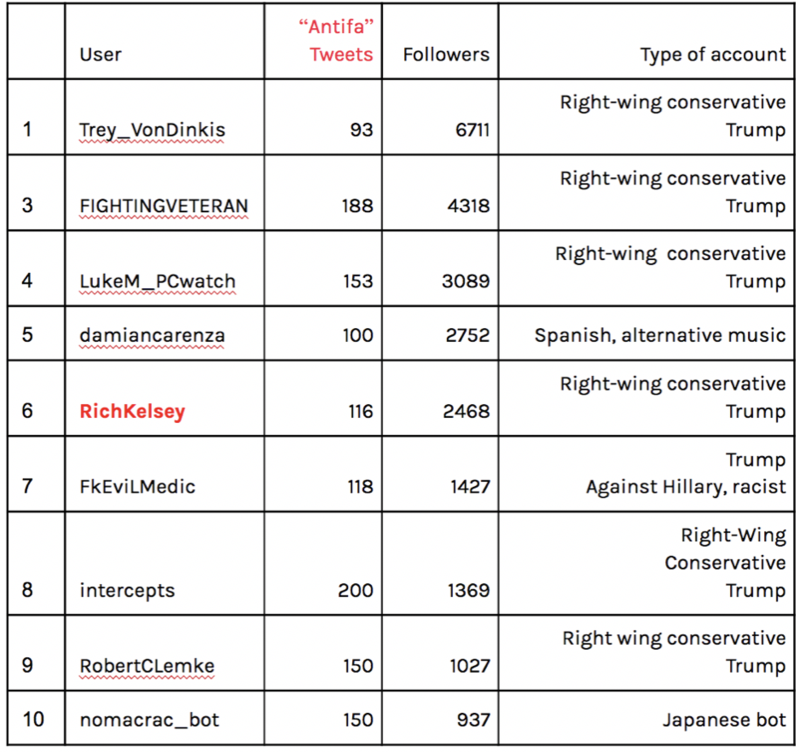 The discourse of the Antifa is driven by leftist organisations (collective, corps, groups) in the US and Japan, and by digital culture, where there is a discursive war between #TCOT (Top Conservatives on Twitter) sympathisers and #p2 (Progressives 2.0). We noted a considerable amount of leftist-referential hashtags, e.g. ARA, Shibaki Corps, CRAC — the latter two hashtags showing that the Antifa discursive environment extends to points outside the bounds of US territory. 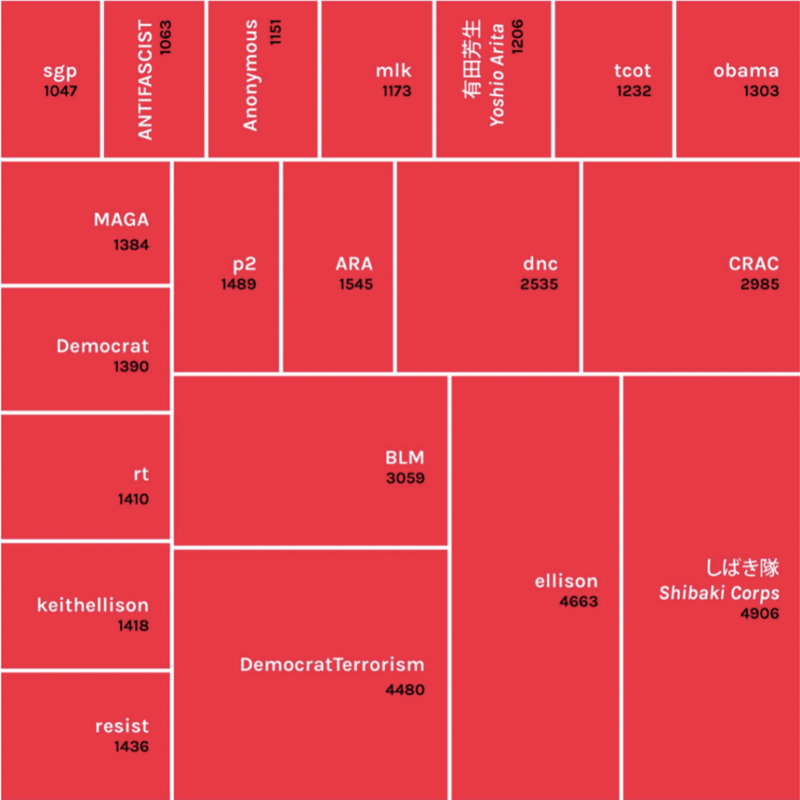 ﻿Figure 1: Top 20 hashtags in Alt Left (green) and Antifa (red) spaces in Twitter, as determined by hashtag frequency, December, 2016-January, 2017. Is the Alt Left an Alt Right construct? 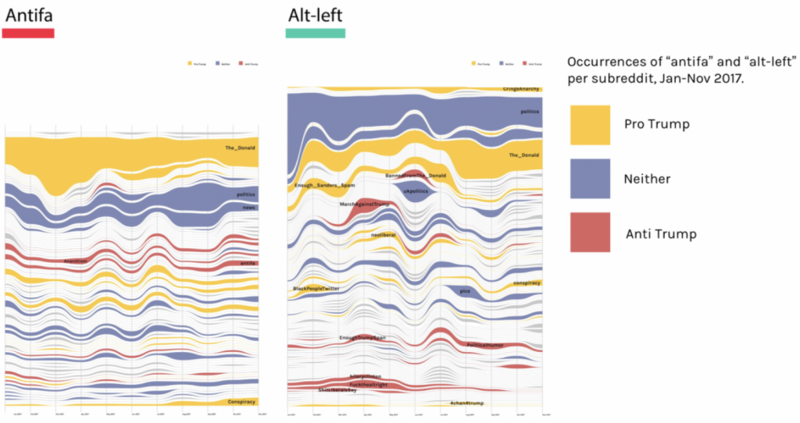 On Twitter, the term Alt Left is mostly used by right-wing, conservative, Trump-supporting Americans, while some European alt right is also present (see figure 2). 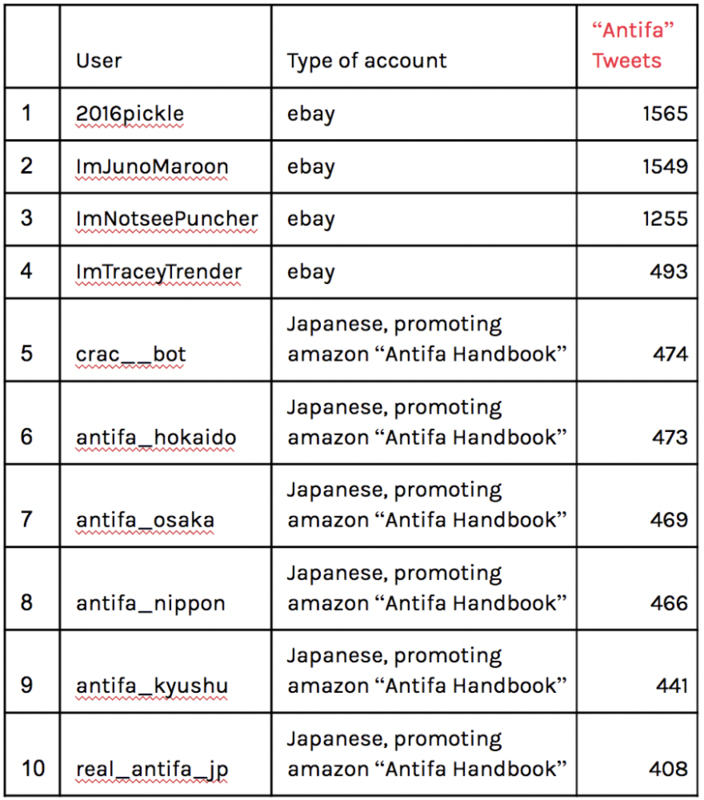 When it comes to “antifa,” our analysis found a lot of bots, Ebay sellers that sell “anti-fascist” stickers etc., Japanese antifa accounts, whose authenticity remains difficult to establish, and clearly fake American Antifa accounts. Figure 2: Top 10 users of #altleft and #antifa on Twitter, December, 2016-January, 2017. 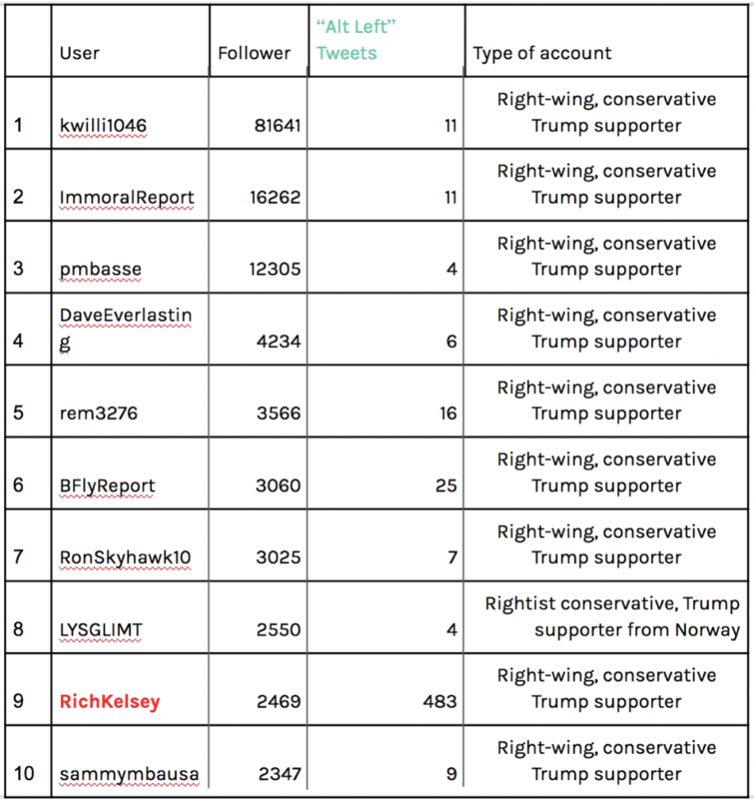 Here again, the “most influential” users of both terms were right-wing, conservative, Trump-supporting Americans or fake Antifa/leftist accounts (see figure 3). 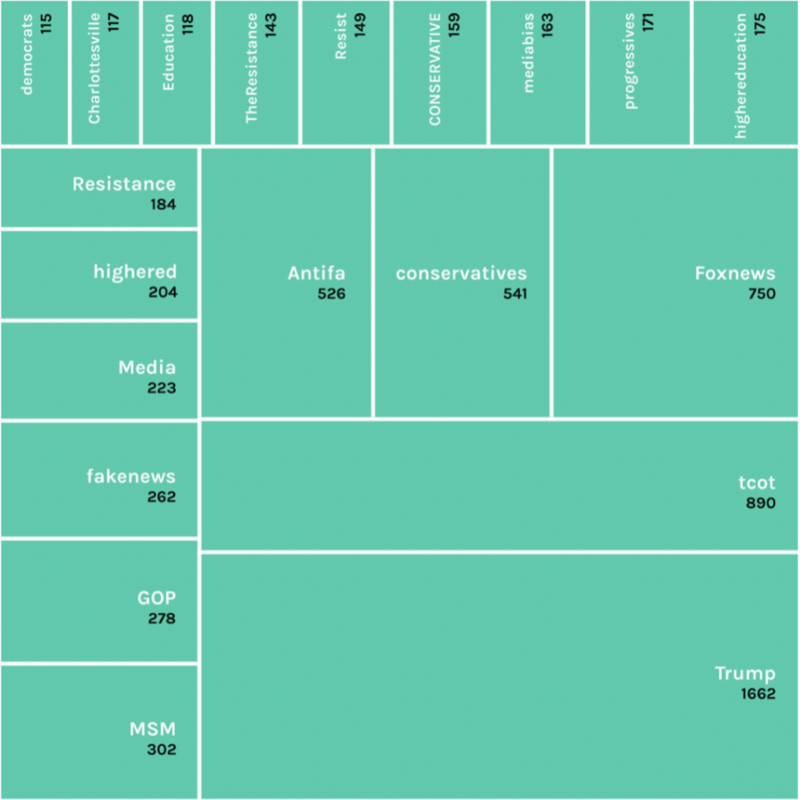 Subsequently, we also found some overlapping results: kiwilli1046, the most influential in the term “alt left” is also present in the “antifa” list, only a little further along the line (he used the term “antifa” 25 times). 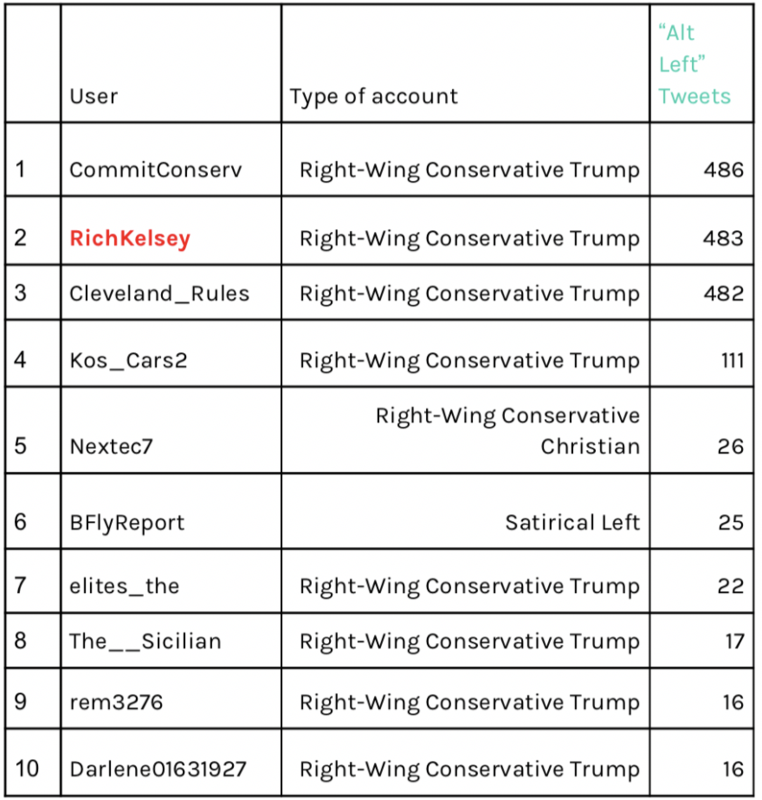 Furthermore, the accounts of Rich Kelsey (editor of the website Committed Conservative) and Cleveland_Rules are present in both Top 30s. Twitter accounts that talk about “antifa” and “alt left” are right-wing, conservative, Trump supporting Americans. There was only one exception, the left-wing account, supporting Antifa, @HalalKitty6. Regarding the networks of users of the #antifa hashtag itself, results showed that they were dominated by the alt right (see figure 4). Figure 4: Users networks of #antifa in Twitter, December, 2016-January, 2017, Gephi forceatlas2, community detection. Alt Left mainstreaming as term? 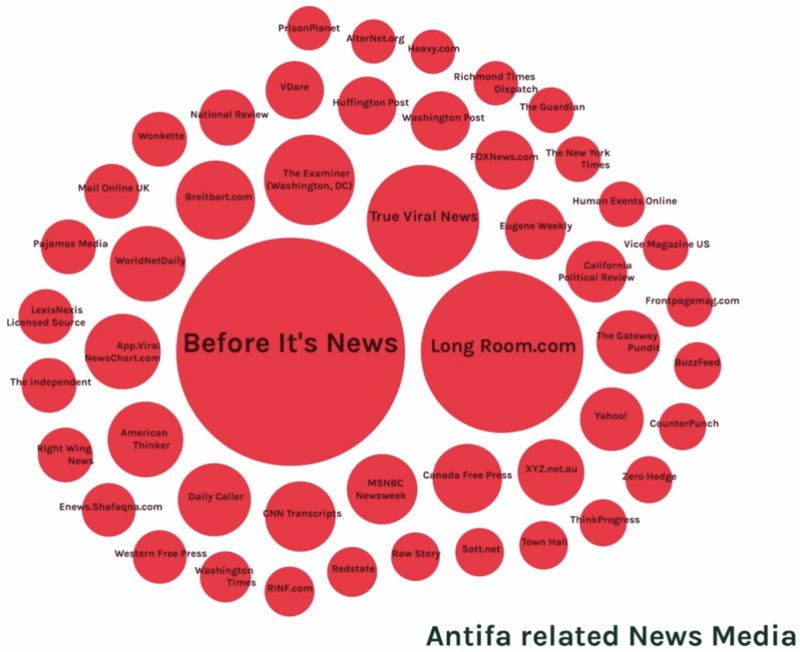 By querying Alt Left and Antifa in Lexus-Nexis Newsdesk, we found that “Alt Left” has mainstreamed; most significantly mentioned by Fox News and CNN, but is sporadic, appearing only after Charlottesville in August 2017 (on Fox News), and shortly afterwards on CNN (see figure 5). 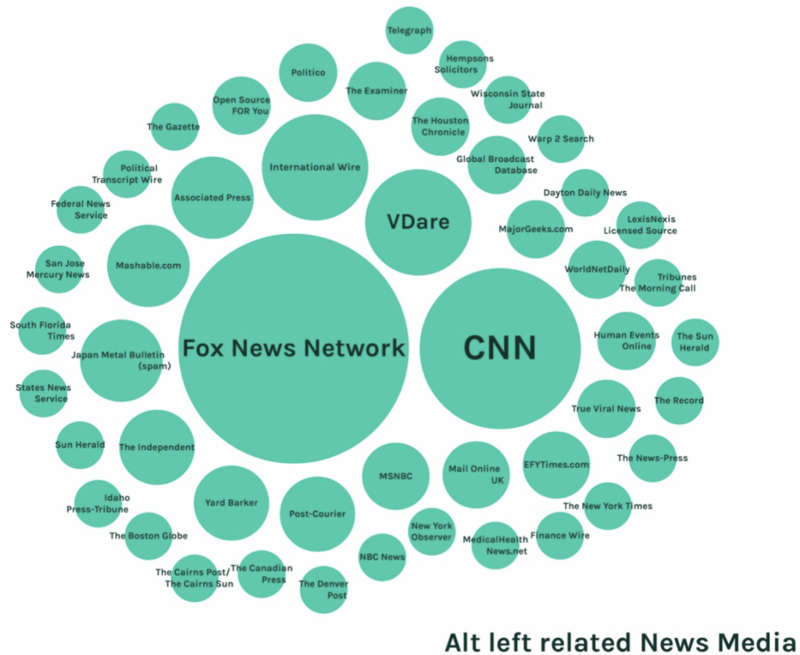 Since its relative decline on mainstream news, the term “Alt Left” was mostly spotted on Vdare.com, the fringe news site describing itself as the “premier news outlet for patriotic immigration reform.” If the term Antifa appears predominantly on fringe news sites (conspiracy, tabloid conservative, predominantly right-of-center political), and has been somewhat marginalised, the label Alt left has mainstreamed. Both terms, however, are kept alive by a broad spectrum of the right. Concerning its emergence, the Alt Left is most significantly associated with pro-Trump subreddits, and increasingly so (see figure 6). 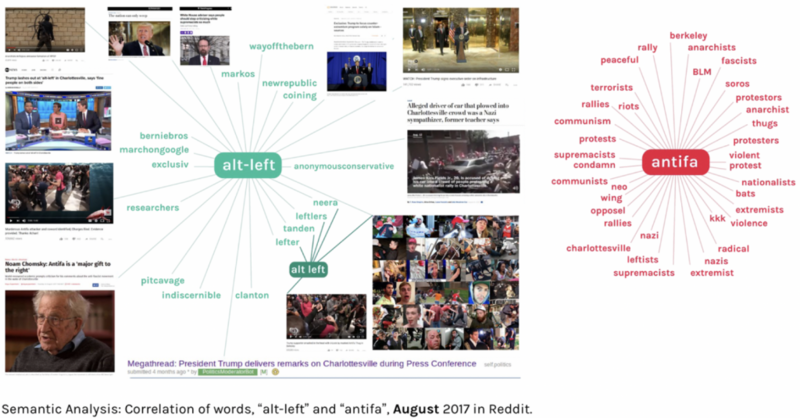 Since the Charlottesville events (August 2017), the subreddit “The_Donald” uses “Alt Left” far more often than “Antifa.” Across the subreddits, and before Charlottesville, the term Alt Left was employed in different contexts. Figure 6: Occurrences of Alt Left and Antifa per subreddit on Reddit, January – November, 2017. Alt left’s association with violence? In Reddit, semantically, the Alt Left hardly existed in subreddits until it appeared after Charlottesville, when it became increasingly associated with violence. Alt Left, the term, was used most often in headlines, be they news, YouTube videos and images, such as on Imgur, GIFs, and meme sharing sites. In terms of word associations, since August 2017 (but not before), the correlation of Alt Left with Antifa was not only made by text, but also by many tokens for videos and images (see figure 7). This finding enabled us to identify a trend that showcased Antifa and Alt Left as violent, linking such images with words holding negative connotations. Starting in August and spreading into November, the terms Alt Left and Antifa were also increasingly associated with one another. The discourses of Alt Left and Antifa spaces are distinctive on Twitter, where the former sits in more mainstream political dialogues. In our mainstream news analysis, the notion of Alt Left resonated significantly on Fox News, suffering, however, a relative decline since the Charlottesville incidents of August 2017, when the Alt Right organised one of its most notorious ‘free speech’ rallies. With respect to its most significant associations, we found (in Reddit) that the Alt Left is most significantly associated with violence. As for its publics or users, on Twitter and on Reddit, the term is mainly employed by pro-Trump supporters. The finding provides a strong indication that the Alt Left as such is ‘fake’ or faux. Trump supporters have succeeded in creating a fictional anti-public, the Alt Left, associating it with violence, as a form of moral equivalency to the Alt Right after Charlottesville, and mainstreaming it in the news. 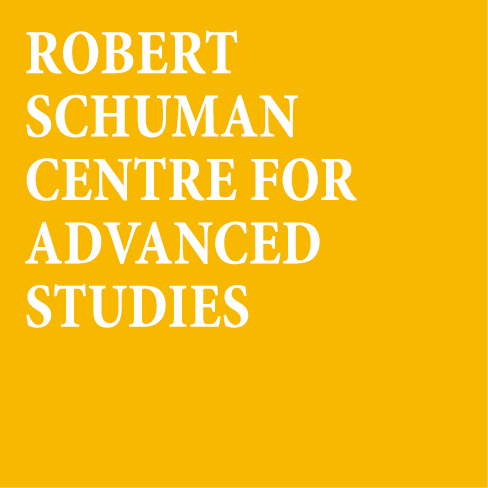 Richard Rogers is Professor in New Media & Digital Culture at the University of Amsterdam. He is Director of Govcom.org, the group responsible for the Issue Crawler and other info-political tools, and the Digital Methods Initiative, dedicated to developing method for Internet research. In collaboration with Umberto Boschi (Utrecht University), Xiaofeng Dai (Designer-researcher-artist), Marissa Klaver (University of Amsterdam), Sterre Meijer (University of Amsterdam), Samantha North (University of Bath), Ryan Tsapatsaris (University of Pennsylvania), Elena Aversa (Density Design, Milan) and Giulia Corona (Density Design, Milan).